I have some voice memos on my phone that I want to put in iTunes but can't get them to transfer. I have them checked under music in the phone preferences but they will not transfer. I saw a program called iPhone Manager that will do it but was wondering why the transfer would not work and if there was something I was missing. Common sense and deodorant are a lot alike. People who need it the most don't use it. So you have 'Sync voice memos' checked in iTunes, is that what you mean? It should put them into your Songs and reference them in a Voice Memos Playlist. Sync voice memos is checked in iTunes. They do not show up in songs and are not referenced in the Voice Memos Playlist. Try unchecking then sync, then check it again and sync. BTW iExplorer works well to transfer. The demo can transfer something like 10 tracks at a time. If that fails, just email them to yourself and, then transfer them to iTunes. Good idea, but what do you know OFI. Were we that young at one time? I tried your last suggestion of unchecking then syncing and checking and syncing and that didn't work. I downloaded the trial version of iExplorer and it recognized everything on the phone except for music. I have a couple of voce memos that are too large to email and I need to burn them to a disc. I am on Mavericks so I can't use Air Drop. Does your iExplorer look like this except sans Rick James when your phone is plugged in? There is nothing there when expanded. It is blank. 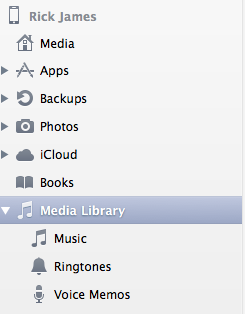 Go to your iTunes media and move all voice memos to an alternate location. A new Voice Memo playlist will be created with your voice memos in iTunes. Hopefully the sync will place the new files in the folder. Now move the previous memos back into the folder. Generated in 0.015 seconds in which 0.009 seconds were spent on a total of 13 queries. Zlib compression enabled.